Honed Marble – the choice of Kings, Queens and Emperors alike; ours are chosen from the exquisite Ionic Stone Honed Marble selection, great quality, beautiful finish. Another great marble, the 'sister tile' of the Polished version - great price and stunning colour range! Silver Moon Honed has the perfect size range for creating a beautiful contemporary room, the name of this tile 'silver moon' says everything about the colour spectrum of this tile. Its a fantastic marble and amazingly cost-effective, terrific value for money. Very consistent in terms of background colour and moderate variation occurs, the variation can be seen in the silver grey hues, darker grey 'swirls' with slate shades and strikes of brilliant white. 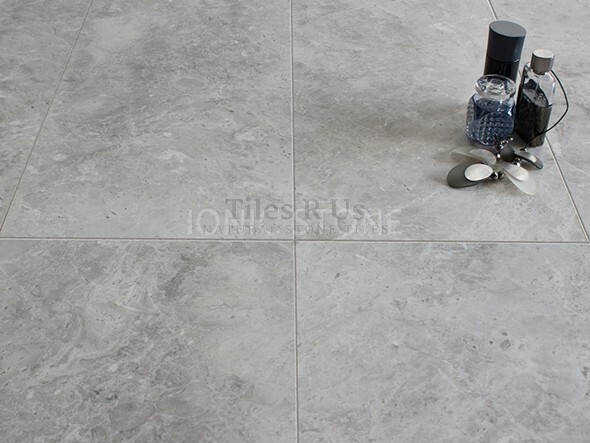 The honed finish is classic marble stone finish and appearance; suitable for both residential and commercial tiling applications.